The Oracle ACFS resources associated with these actions are not created for Oracle Restart configurations. While Oracle ACFS resource management is fully supported for Oracle Grid Infrastructure configurations, the Oracle ACFS resource-based management actions must be replaced with alternative, sometimes manual, operations in Oracle Restart configurations. 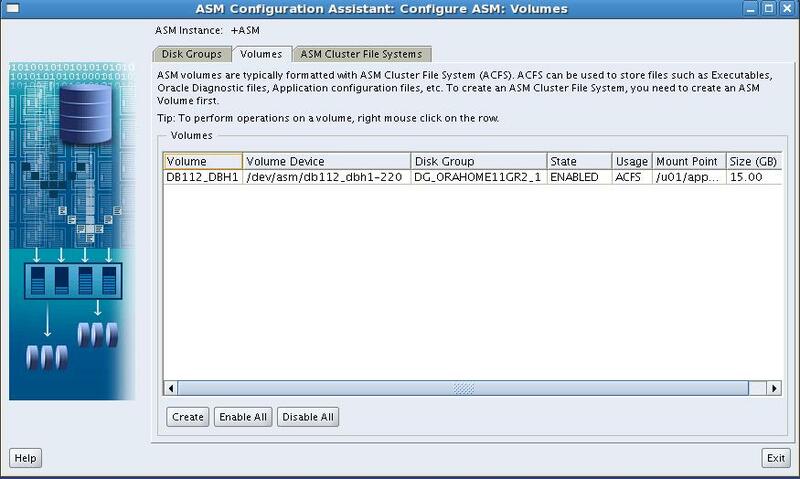 Why use ACFS (i.e Cluster Filesystem) on Single Node Installation? It makes no sense!!! Using O.S filesystem I have all resources of ACFS (Performance, Manageability and Availability). And using ACFS on Single Node (Oracle Restart) is very poor many task must be performed manually (like load drivers, mountfilesystem,etc) . Particularly I do not use ACFS on Single Nodes, I see no need for that. I created this post just for fun and to help those wich use ACFS on Oracle Restart. ACFS has a feature that does not have on S.O filesystem. ACFS provides snapshotting capability for the respective filesystem. This snapshot uses the First Copy-on-Write (FCOW) methodology to enable a consistent, version-based, online view of the source filesystem. Snapshots are immutable views of the source file system as it appeared at a specific point in time. Snapshots are initially a sparse filesystem, as the source filesystem files change, the before-image extent of that file is copied into the snapshot directory. Accessing the snapshot will always provide a point-in-time view of a file, thus ACFS snapshots can be very useful for file-based recovery or for filesystem backups. If file level recovery is needed (for the base filesystem), it can be performed using standard file copy or replace commands. A possible use case scenario for snapshots can be to create a consistent recovery point set between the database ORACLE_HOME and the database. This is useful, for example, when a recovery point needs to be established before applying a database patchset. 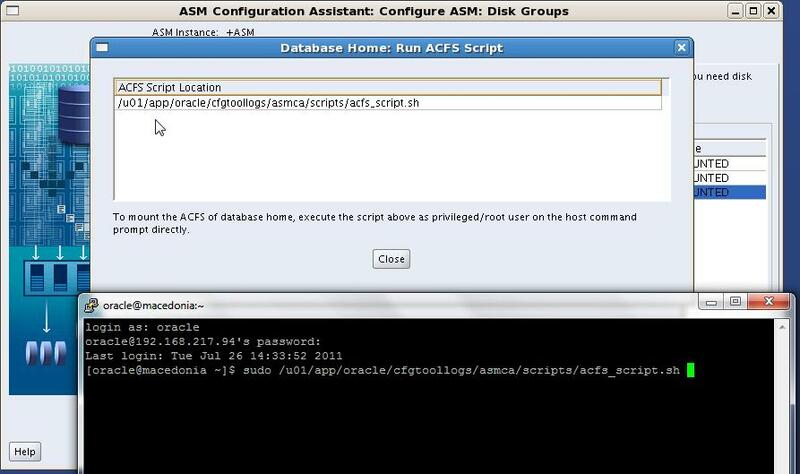 Important: Be very careful using Oracle ACFS filesystem to ORACLE_HOME. 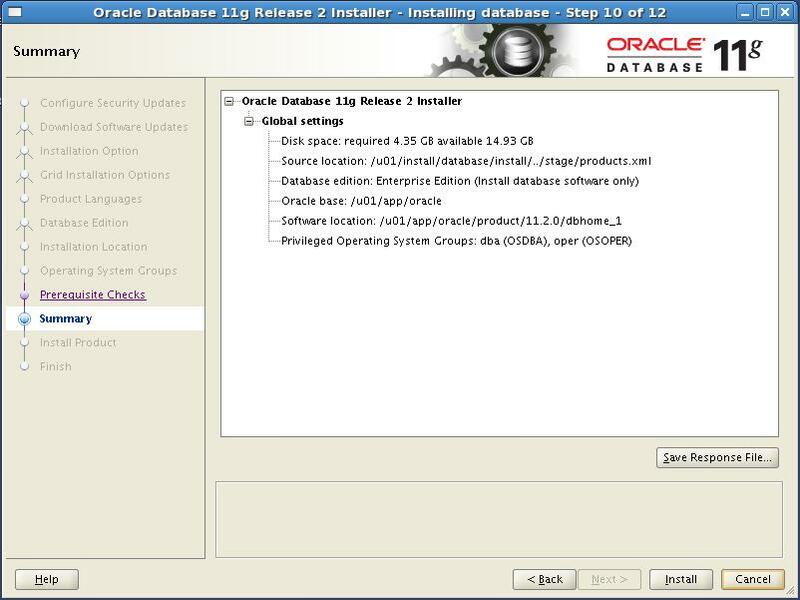 When you create a database using this ORACLE_HOME this database is automatically registred on OHAS (Oracle Restart). If you restart Server OHAS will try start this database automatically, but the filesystem (ACFS) of ORACLE_HOME is not mounted automatically must be done manually , therefore all databases of this ORACLE_HOME must be started manually too. I’ll show you how to automate the process of load and drivers of ACFS and mounting/umounting filesystem using OHAS. Configure Oracle Home location, Size (GB), user and group. ASMCA does not support root-based Oracle ACFS resources, so must be done manually. Oracle automatically generate a script to mount this filesystem. If you restart your Server, the ASCS drivers will be not loaded automatically, therefore te TAB (Volumes and ASM Cluster File Systems) of ASMCA will be inactive. Setting up AUTO MOUNT/AUTO UMOUNT of Filesystem on OHAS. We can use OHAS to start, stop, monitor and restart applications. Using feature RESOURCE of OHAS. Let’s create a script to mount/umount ACFS Filesystem. I used the “sudo” to perform root-tasks. So you must allow user oracle perform root actions without password. Using root privileges (or root user) type “visudo” to edit sudoers file. Comment the line "Defaults    requiretty"
START_DEPENDENCIES: Specifies a set of relationships that OHAS considers when starting a resource. You can specify a space-separated list of dependencies on several resources and resource types on which a particular resource can depend. hard: Specify a hard start dependency for a resource when you want the resource to start only when a particular resource or resource of a particular type starts. Oracle recommends that resources with hard start dependencies also have pullup start dependencies. pullup: When you specify the pullup start dependency for a resource, then this resource starts as a result of named resources starting. So, We must specify the START_DEPENDENCIES referencing to DISKGROUP DG_ORAHOME11GR2_1 where are ORACLE_HOME filesystem, that’s means when you try start the resource “acfs.orahome11gR2_1.fs” the DISKGROUP DG_ORAHOME11GR2_1 must be started, if DISKGROUP DG_ORAHOME11GR2_1 is not started “pullup” will try start DISKGROUP DG_ORAHOME11GR2_1 before try start resource “acfs.orahome11gR2_1.fs”. STOP_DEPENDENCIES: Specifies a set of relationships that OHAS considers when stopping a resource. hard: Specify a hard stop dependency for a resource that you want to stop when named resources or resources of a particular resource type stop. Now you can restart your server and make sure wich the filesystem will be mounted at startup of OHAS. If everything is ok you can install Oracle Software on ACFS. 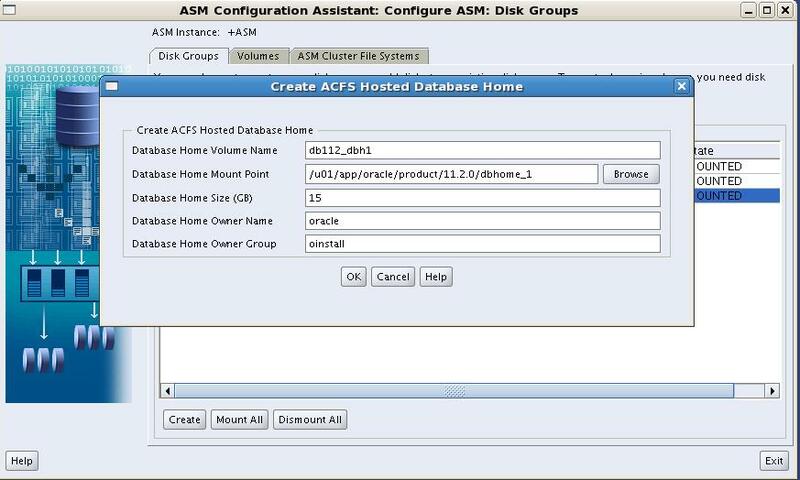 I created a Database (db11g) using ORACLE_HOME on ACFS. 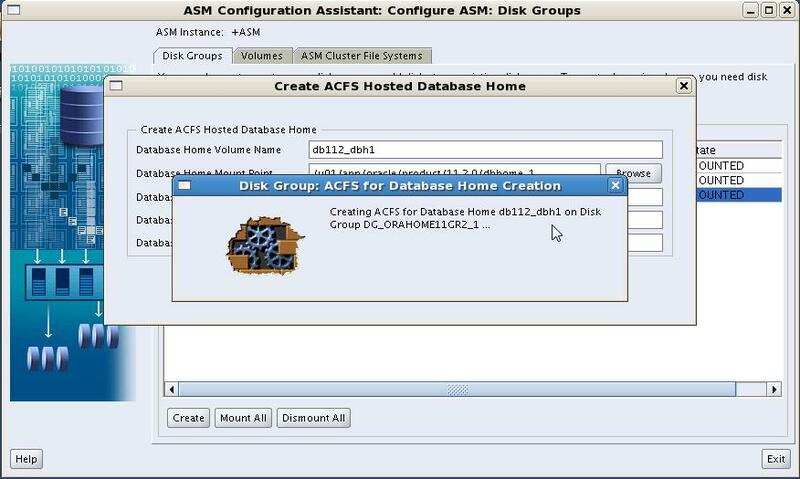 When DBCA create a Database (Oracle Restart) he doesn’t create dependencies between ACFS Mount and Database. So, when OHAS start a Database (db11g) he will try start only DISKGROUPs where database files are and just it. As ORACLE_HOME is not mounted Database will not start automatically. 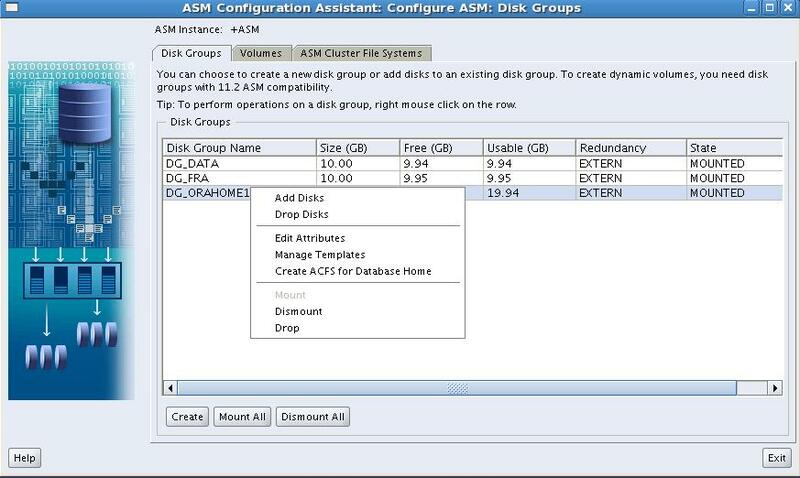 We must create a dependencie between ACFS Mount and Database (like oracle does with Diskgroup). Using Resource name of Database (ora.db11g.db) let’s create dependencies. To Start Database (db11g) the ACFS Filesystem must be mounted. And to Stop ACFS Filesystem Database must be OFFLINE. If we try start Database without ACFS Filesystem mounted OHAS will try start ACFS Filesystem before start Database. Creating this dependencies does not affect config of Database in OHAS. Starting only database, all resources dependents must be UP automatically. This was my exam question, still not sure about the answer. Which three fragments will complete this statement correctly ? c-) will be automatically mounted by a node if it is defined as cluster stack startup if it is included in the ACFS mount registry. f-)must be mounted before it can be registered. The Oracle ACFS mount registry supports both Oracle Restart and Oracle Grid Infrastructure cluster configurations. File systems that are to be mounted persistently (across reboots) can be registered with the Oracle ACFS mount registry. 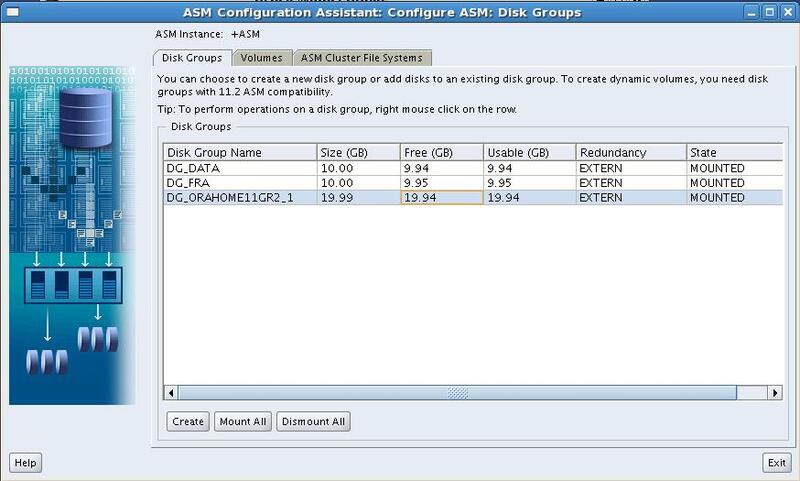 In cluster configurations, registered Oracle ACFS file systems are automatically mounted by the mount registry, similar to a clusterwide mount table. However, in Oracle Restart configurations the automatic mounting of registered Oracle ACFS file systems is not supported. By default, an Oracle ACFS file system that is inserted into the cluster mount registry is automatically mounted on all cluster members, including cluster members that are added after the registry addition. However, the cluster mount registry also accommodates single-node and multi-node (subset of cluster nodes) file system registrations. The mount registry actions for each cluster member mount only registered file systems that have been designated for mounting on that member. Appreciate your help and explanation. I know that we can mount acfs volumes using asmca. Can we also mount acfs volumes using asmcmd utility ? I answered this question in OTN. Appreciate your time and assistance. I am just wondering whether this is also possible with Oracle Enterprise Manager or Oracle Universal Installer using runInstaller -clone ?